St John Roberts was born into a farming family in Trawsfynydd, Wales. He was baptised a Protestant, having received religious instruction from a local Monk. He studied at Oxford and then at London. On a visit to Notre Dame Cathedral in Paris, St John converted to Catholicism and then joined the Benedictines in Spain. He was ordained a Priest in 1602 and six months later went with other companions to England where he was appointed Vicar of the Benedictine English Monks. However, his stay in England was short-lived. Within a month he was arrested on suspicion of being a Catholic and extradited to France. St John didn’t relinquish his English mission and soon returned to work among the plague victims of London. But again, in 1604 he was once more arrested and extradited; a pattern that was to be repeated four times over the following years. During one of his rearrests, he was imprisoned for several months at the Gatehouse Prison in London. On St John’s final return to England, he was captured as he prepared to say Mass and taken, in his vestments, to Newgate Prison, London. 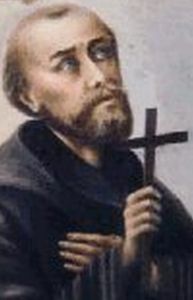 St John was found guilty of, “being a Catholic Priest and ministering Priestly duties”. He was sentenced to hanging, drawing and quartering (cutting of his body into four parts). During St John’s hanging, although it was normal practice to disembowel (“drawing”) while still alive, because of his popularity among the gathered crowd, the gruesome act was omitted and rather than the usual shouts of “Long live the King” (King James), the crowd fell silent. St John was just 33yrs old at the time of his martyrdom. His body was taken to St Gregory’s, Douai in France; a monastery that he had established during his times of exile from England. His Feast Day is the 25th October. Pray that we will proudly uphold the teachings of the Catholic faith and actively share them with others.